In The Road to Character, David Brooks focuses on the deeper values that should inform our lives. Brooks challenges us, and himself, to re-balance the scales between our "resume virtues" - achieving wealth, fame and status - and our "eulogy virtues," those that exist at the core of our being: kindness, bravery, honesty or faithfulness. Looking to some of the world's greatest thinkers and inspiring leaders, Brooks explores how, through internal struggle and a sense of their own limitations, they have built a strong inner character. The Road to Character provides an opportunity for us to rethink our priorities and strive to build rich inner lives marked by humility and moral depth. Although this is a secular book, it includes discussion of major religious figures such as Dorothy Day and Augustine. Julius Erving, the legendary “Dr. J,” enthralled basketball fans for 11 seasons with the Philadelphia 76ers, leading the team to the NBA crown in 1983. The dominant player of his era, Erving was one of the first players to make individual expression a vital part of the game, with his graceful midair spins and twirls punctuated by powerful slam dunks. Elected to the Naismith Memorial Basketball Hall of Fame in 1993, Erving was an 11-time All Star. He received the J. Walter Kennedy Citizenship Award in 1983 and in 1996 was named one of Sports Illustrated’s 50 Greatest Players in NBA History. In his new memoir, the Philadelphia legend reflects on his life on and off the court. The International Forum’s Book Club meets once a month on Sundays from 11:00 AM until noon at Books Inc. in Opera Plaza. This month's book is "No Ancient Wisdom, No Followers: The Challenges of Chinese Authoritarian Capitalism" by James McGregor. New members are always welcome! For more information, please contact ifbookclub@gmail.com. This event was developed by members of the World Affairs Council's International Forum, a globally minded multicultural group that acts as an interactive arm of the Council. We host events, informal group discussions, social gatherings, book clubs and other networking opportunities. To learn about upcoming events and ways to get involved, visit our website or like our Facebook page. 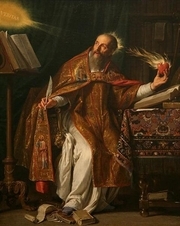 Augustine of Hippo (Latin: Aurelius Augustinus Hipponensis; 13 November 354 – 28 August 430), also known as Saint Augustine or Saint Austin, was an early Christian theologian whose writings were very influential in the development of Western Christianity and Western philosophy. He was bishop of Hippo Regius (present-day Annaba, Algeria) located in the Roman province of Africa. Writing during the Patristic Era, he is viewed as one of the most important Church Fathers in the West. Among his most important works are City of God and Confessions, which continue to be read widely today. Augustine is currently considered a "single author." If one or more works are by a distinct, homonymous authors, go ahead and split the author. Augustine is composed of 129 names. You can examine and separate out names.